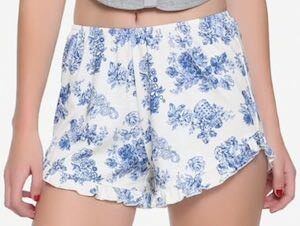 Doctor Who fans that like some nice shorts should check out these women’s blue and white china shorts. The women’s shorts are white with on it in blue some fun patterns that look a lot like the blue and white China. The print shows flowers and with the flowers you can see gears, Dalek, and the Tardis. The Doctor Who shorts are made from 97% rayon and 5% spandex making them perfect as shorts for summer or maybe as sleep shorts in winter. Now Doctor Who fan can wear shorts they like and these Doctor Who shorts come in women’s junior sizes XSmall – 2XL.